See what humiliation I’m willing to endure for you, dear readers? 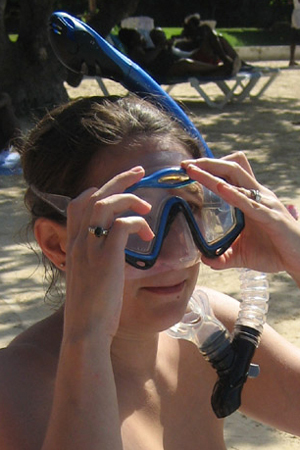 The reason I love snorkeling so much is that it’s always been quite difficult for me. I can’t really swim (pathetic, but true) and no matter how many times I’ve gone snorkeling, I always have to work through a minor panic attack to get accustomed to inhaling with my masked face in the water. Yet, embarrassing-fish-out-of-water moment notwithstanding (or would that be fish “in” water? ), it is far and away my favorite activity. The experience of floating above and peering into a hidden, technicolor world is awesome, of course, in the truest sense of the word. But I’ve come to realize that what I really like about snorkeling—the peaceful and relaxation of it—is overcoming the obstacle. Meeting the challenge. Flipping the finger to my fear. Whatever that “thing” is for you, honor it today. Seize it, do it, tackle it! I wish you pure bliss in the accomplishment of it.